Ohhhhh, how I want one of these rat rods! I am so in love with the rust of it all! 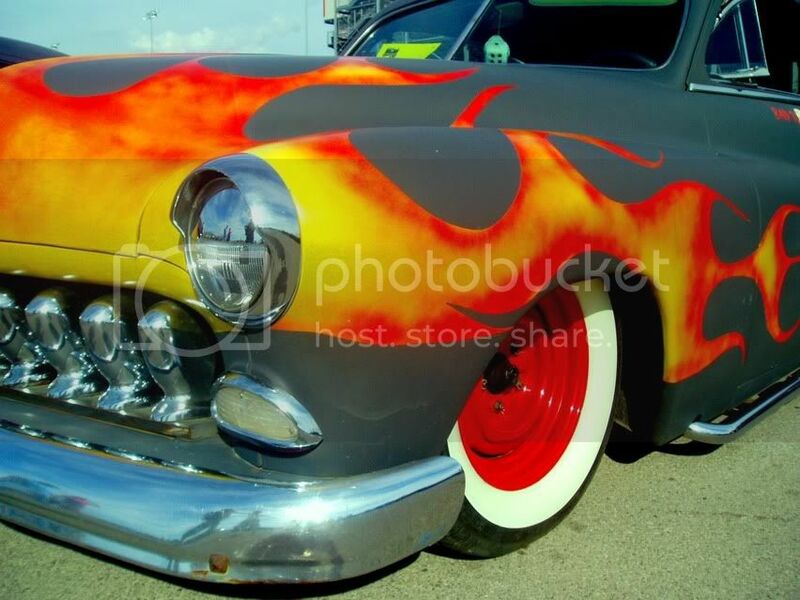 Went to this car show last weekend & wow, what an absoulute culture movement this is, it was like time travel back to the 40's & 50's... pin up girls, guys in dyed black greased back hair, rolled up Levi's, black leather jackets, tatooes, piercings. Looked like the bad kids from the movie Grease. The cars are usually rusty, dented, with flat paint jobs no clear over the paint. Alot of the cars had actual flames shooting from the exhaust! They were filming a movie for tv that day, so I talked with the producers & others about the making of this movie, they call it the "rat rod generation movement"
Later that night I was going to again, attempt to race my truck, but they weren't allowing any more cars to enter to race. Last week I had the superchip programed into my truck, wow! what a huge difference in the shifting & the horsepower...it is sooo quick, it has scared me a few times, almost lost it around corners. So I am anxious to see how fast it will go in the quarter mile, so I will try again to race next week. I have a chevrolet site/blog. It pretty much covers ##KEYWORD## related stuff. Mm, yeah. Aside from the cool cars, you can get a lot of enjoyment from the people who have the rockabilly fashion sense. A blast from the past, indeed. Those rat rods look like they've experienced similar things way back when it was their prime.